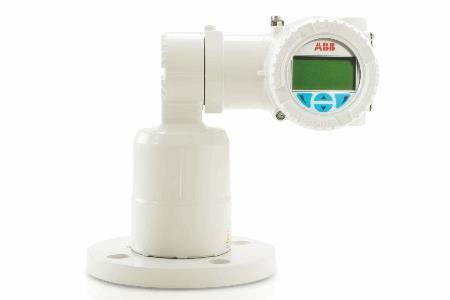 ABB, a world leader in energy and automation technologies, introduces the LLT100 laser level transmitter, the new standard for laser level measurement. The LLT100 revolutionizes the level measurement industry. It is designed for all industrial applications and replaces open-path radar and other level transmitters. This new product changes the way level measurement is performed. It is measurement made easy. The LLT100 measures the level of any material, solid or liquid, independently of its properties or conditions. With its narrow laser beam, the LLT100 can avoid obstructions, can be installed near vessel walls, or in tanks with mixing blades, grids or obstructions. The LLT100 measures continuously and provides rapid surface change tracking. In addition, the advanced signal processing delivers reliable measurements in the presence of mixers and in dusty, foggy and narrow environments. Even clear liquids are measureable and no longer a limitation for laser level devices. The LLT100 embodies the ABB “Measurement made easy” design philosophy by providing one versatile device for many applications than before. Easy configuration, fast installation and loop-power make it convenient to use. It has a rugged IP 67 / NEMA 4X enclosure and is approved for use in hazardous areas (class 1/division 1 (zone 1). It is suitable for applications in challenging industrial environments such as mining, aggregates, oil and gas, chemicals, food and beverages, power, pulp and paper, pharma, water and waste water. ABB’s Measurement & Analytics business unit is among the world’s leading manufacturers and suppliers of instrumentation and analyzers. With thousands of experts around the world and high performance technology, ABB’s team is dedicated to making measurement easy for its customers. ABB is a leading global technology company in power and automation that enables utility, industry, and transport & infrastructure customers to improve their performance while lowering environmental impact. The ABB Group of companies operates in roughly 100 countries and employs about 135,000 people. For more information, visit www.abb.com.